There's something to be said for games that distill their entire purpose into four words. And using those four words as a title? Hat tip to you, fine developers! Machine Gun Train Run is a sidescrolling platform shooter that gives you a machine gun, puts you on top of a train, and gets you to run around shooting things. Surprised? You shouldn't be! 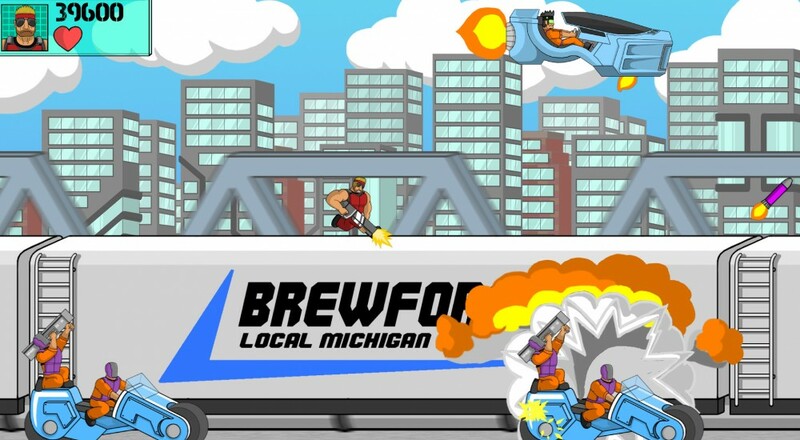 Machine Gun Train Run is an unapologetically cheesy arcade gaming experience. From the visuals to the setting to the sense of humor, everything about this title just screams "quirky". In the year 2033, maglev trains run around the entire world. The criminal group A.S.S.H.A.T. has started hijacking these trains, which is bad for, you know, like, everyone but those A.S.S.H.A.T.s. There is hope, however. The Power Assault Leader Squad is here, and they've got guns! 15 boss fights and four locations to explore, each filled with classic insane arcade shooting action. Machine Gun Train Run features local co-op for two players, each controlling one of the PALS members. In addition to the main campaign, endless and speedrun modes give you more excuses to shoot things. Both are compatible with co-op play as well, which is a rare bonus. So go on, grab your bandana and a sleeveless shirt and start shooting! Page created in 1.6410 seconds.